As we had been here before, we did not book a ships tour, so after a lie in we had a leisurely breakfast then headed out. The Azamara Quest was docked right near the port entrance, so we decided to head out on foot to the City of Arts and Sciences, produced by world renowned and local architect Santiago Calatrava. This area contains six futuristic-looking venues and a variety of restaurants, and is built on the dry river bed of the now diverted River Turia. It only took us about 20 minutes to walk there from the port, and we spent a few hours walking around and taking lots of photos of the very modern structures. Back on board Azamara Quest for a late lunch with new friend Joan, we spent the afternoon relaxing and watching the crew set the deck up for the evenings White Party. The crew worked so hard; they had to remove all the sun loungers, and then set up tables, chairs and place settings. They even placed tables for two up on the second level, overlooking the pool. We returned to the pool area about 6:30, and the open-deck Mediterranean-themed buffet was well under way. The pool deck grill area was transformed into a buffet station, with a real BBQ featuring flame grilled chicken and steaks (cooked by Hotel Manager Richard), a meats and cheeses area, and plenty of hot dishes and fresh salads on offer, as well as Turkey gyros. 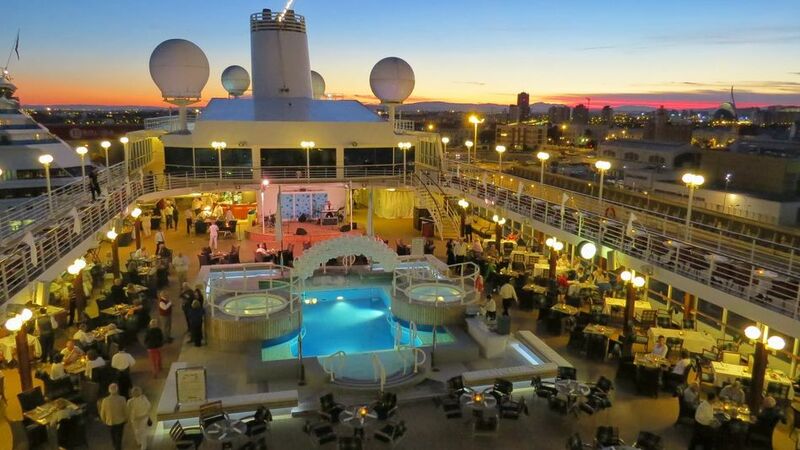 The pool was decorated with a white balloon arch and at 8:15 the band arrived along with the ships singers and dancers to get the party started. People were soon up on their feet dancing and enjoying the atmosphere (as well as trying to stay warm as once the sun had gone down it was a bit chilly!). It was a great night and wonderful atmosphere, and as we set sail at 10:00 pm the party came to a close, with the party continuing in The Looking Glass.